Silver diamine fluoride (SDF) is a substance that can be applied on dental caries - where tooth mass has been destroyed by the action of bacteria that feed primarily on simple sugars. (Candy and sugary drinks are major culprits in this respect; fruits are not, in part because of the combination of a relatively low sugar content with the protective effect of the extra chewing needed.) Many studies have shown the effectiveness of SDF in the treatment of dental caries. The chart below is based on a study by Chu and colleagues (). The chart above compares, in terms of normalized performance, “arrested” caries in a group of children using SDF against a control group not using SDF. Arrested caries are those in which there is no progression of the lesion; that is, in arrested caries the destruction of tooth mass is either stopped or reversed. 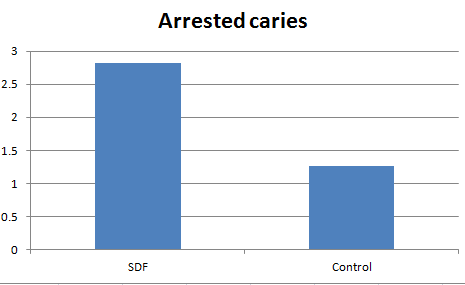 The control group level can be seen as one in which a limited amount of arrest occurs (probably due to dietary changes and improved dental care), because the percentage of arrests among those treated with SDF was 100! And, yes, in spite of what most dentists will tell you, tooth decay can be reversed (). As a side note, dentists do not necessarily tell their clients that tooth decay is irreversible because they want to keep the revenue flow coming into their offices. The sad reality is that most dental care patients will not be able to change their diet enough to reverse tooth decay. Because of that, it would arguably be professionally irresponsible to tell those patients that tooth decay progression can be stopped or reversed without treatment. As Weston Price has shown in his pioneering field studies (), reversing tooth decay requires not only elimination of refined sugars but also increased intake of fat-soluble vitamins (particularly vitamins A, D, and K2). The chart below is from the same study by Chu and colleagues. 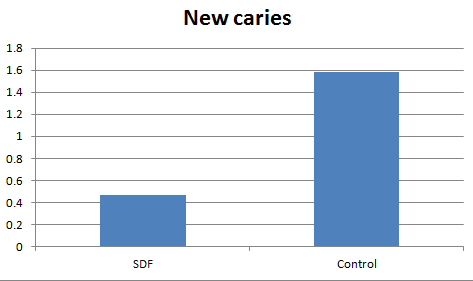 It compares, also in terms of normalized performance, new caries formed over a period of time in a group of children using SDF against a control group not using SDF. As you can see from this and the previous chart, not only does SDF application stop or reverse tooth decay, it also prevents new dental caries from forming. From the empirical results it appears that this extends to teeth other than the teeth treated with SDF, presumably because of the action of the offending bacteria on the teeth that are next to those with caries. SDF has been used in the past in various countries such as China, Japan, and New Zealand. Only recently the use of SDF has been approved in the USA. So, next time you go to the dentist to have dental caries treated, ask if they are able to use SDF and what the likely outcomes will be. Probably there will be no injections, drillings, or fillings. It seems that the only downside is that the brown spots characteristic of tooth decay tend to turn black after SDF is successfully used!